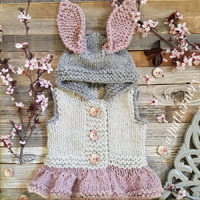 Go to original pattern for design DROPS Children 15-5. Knitted shrug in garter st, with crochet edge in DROPS Alpaca and DROPS Vivaldi. Size children 5 to 14 years. DROPS STRAIGHT NEEDLES size 6 mm / US 10 or the size needed to obtain the correct gauge. 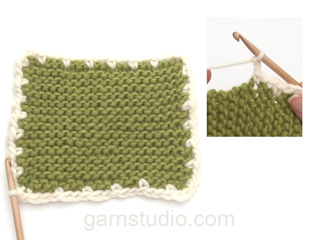 Knitting gauge: 15 sts x 30 rows on needle size 6 mm / US 10 with 1 strand of each yarn worked in garter sts = 10 x 10 cm / 4'' x 4''. 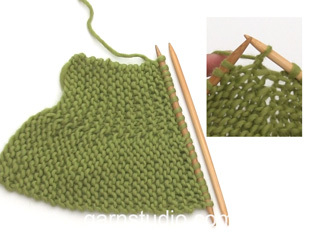 Knitting tips: When turning in the middle of the work, - slip the first st , tighten the yarn and work back. This is done to avoid a hole in the transition. 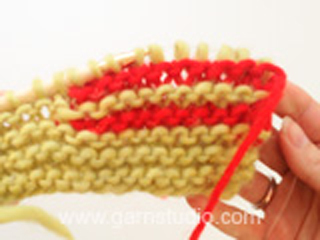 Short rows: - Read knitting tips. *K 2 rows back and forth over all sts. K 18-19-20-21-22 sts, turn, K back over these sts. K over all sts, turn, K 18-19-20-21-22 sts, turn, K back over these sts. Work the shrug sideways, i.e. beg. at the side, work the back and bind off at the other side. Knit the piece in garter sts (i.e. K on all rows until finished). Cast on 54-57-60-63-66 sts on needle size 6 mm / US 10 with 1 strand of each yarn. Work with short rows – see explanation above. When the piece measures 37-41-47-52-57 cm / 14½"-16 1/8"-18½"-20½"-22½" (measured from the middle of the row) and approx. 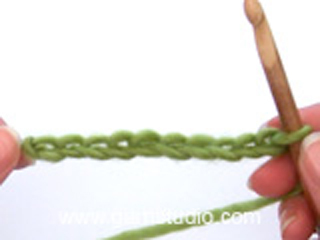 46-52-59-65-72 cm / 18"-23 1/4"-23 1/4"-25½"-28 3/8" (measured from the side), bind off loosely. Fold A towards a and B towards b – see fig. 2. Sew 6-6-7-7-8 cm / 2½"-2½"-2 3/4"-2 3/4"-3" tog. at the edge each side (=12-13-13-14-14 cm /4 3/4"-5"-5"-5½"-5½" for arm holes). Crochet an edge around the shrug with 1 strand of each yarn on hook size 5 mm / H as follows: 1 sc in the first garter st, ch 4, skip 4 rows of garter sts, 1 sc in the next garter st, repeat from *-* and finish with 1 sl st at the beg. of round. = Measure chart. The garment is folded. = Show the garment fully assembled. How to use the garment. I have made this bolero & looks the same as fig 2. sewn a to A & b to B by the correct cm but it does not look like fig. 3 does not have curved front. What am I doing wrong please. Dear Ria, after you have sew A to a B to b tog, rotate piece so that the ridges are vertically on back piece to get the same as fig. 3. (= holes are for armholes). Happy knitting! Hoi Monique. Wij verkopen geen acrylgarens. Je kan vervangen door 1 draad 100% katoen: DROPS Paris. Wil je toch acryl moet je contact opnemen met je winkel voor een ander alternatief. Veel plezier. 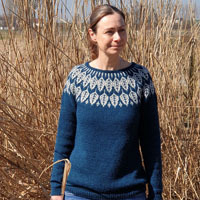 I have completed the knitting and can't figure out where the armholes come from and how to sew the seams? I am very frustrated with this pattern . Dear Wendy, see fig. 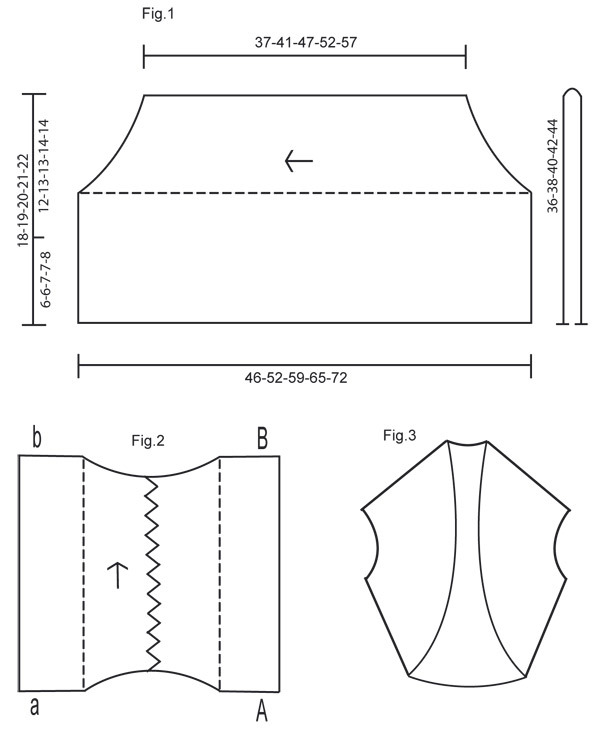 2: armholes are a+A and b+B - sew 6-7-8 cm (see size) starting from outside towards inside - when piece is sewn tog, you will have fig.3. Happy knitting! Oke, dank je wel. Nu gaat het vast lukken. Waarschijnlijk lees ik iets niet goed maar ik begrijp niet hoe vaak je de verkorte toeren moet breien. Daarnaast snap ik niet hoe je aan het eind in een keer af moet kanten. Hier moet toch ook een ronding komen. Help, wat doe ik verkeerd? Alvast bedankt voor de uitleg. Hoi Marleen. Je breit de hele tijd de verkorte toeren vanaf het begin tot de vereiste afmetingen. Door de verkorte toeren wordt het werk breder aan de zijkanten komt automatisch de ronding beneden en boven. Je kant dus gewoon alle st af zoals beschreven. I was making this shrug with size 7-8. According to the fig 2 it seems it's done in one piece, and then folded in the middle. Is 41 cm is the beginning length then how do I end up with 52 cm at the bottom ie fig 1. Is the curved part the arm hole. This is the first time I am making a shrug, that is why I am having difficulty in understanding it. According to fig 2 there are two curve sides. 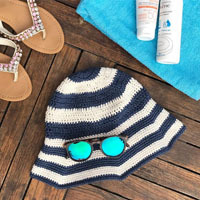 How do I get this if knitted in one piece. Thanks for your help. Dear Mrs Saroj, you will work short rows, ie as shown in Fig.2 with knitting direction, you work more rows in each side than in the middle. The 41 cm is measured in the middle of the piece when worked (zigzag in Fig.2) and 52 cm is the length along each side A/B and a/b where you have worked more rows. Happy knitting! Il n'y a aucune précision quant au nombre de mailles à rabattre à 37 cm puis à 46 cm afin de terminer la réalisation du boléro ? J'arrive presque à cette étape et je ne sais que faire car rien n'est mentionné. Merci pour votre réponse. Bonjour Delphine, le nombre de mailles est le même que celui que vous avez monté (soit 54 m dans la 1ère taille), on tricote des rangs raccourcis, et on rabat les mailles quand l'ouvrage mesure au milieu de l'ouvrage et environ 46 cm sur le côté - voir fig.1 (ouvrage plié en double) et fig.2 (37 cm = le long de la ligne zig-zag). Bon tricot! Je suis en train de tricoter ce joli boléro, il est spécifié d'un besoin de 100 grammes de laine soit 2 pelotes de 50 grammes pour toutes les tailles, j'en suis déjà à 4 pelotes de 50 grammes pour la taille 7/8 ans et je pense que j'aurai besoin encore d'une de plus. Mêmes aiguilles et même grosseur de laine. Bonjour Mme Helyett, avez-vous bien vérifié le métrage et votre échantillon ? Le boléro se tricote avec 1 fil Alpaca + 1 fil Vivaldi sur la base de 15 m x 30 rangs point mousse = 10 x 10 cm. Bon tricot! Hoi José. Kijk op de tekeningen onderaan het patroon. Fig. 2 laat je zien hoe het breiwerk uitziet voordat je gaat vouwen. Je vouwt dan het werk bij de zigzag lijn (fig. 1) en naait nu de randjes b aan B en a aan A. (= armsgaten). Het resultaat zie je in fig. 3. Hola Francis! Cuando decimos fila es o bien la ida o la vta. 2 filas de ida y vta quiere decir 1 fila de ida y una de vta.